WHAT?! NO AIR CONDITIONING? NO WHIRLPOOL? Exercise Warehouse Gym is not a health spa. We do not have any gimmicks to interfere with your workout. We've created an atmosphere for results. Not lounging around. We do have clean locker and shower rooms for men and women for your convenience. 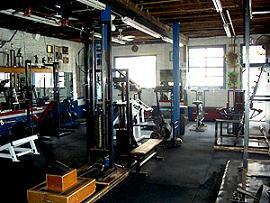 Because we've designed Exercise Warehouse Gym to be the best! A friendly and motivating training atmosphere helps you to achieve your goals. YOU NEED a facility this good!